Is it possible to simulate scenarios without using EPANET-MSX? A question has come to my mind, is there any answer? If the simple simulation be the same simulation that is done only by EPANET not by EPANET-MSX. Is it possible to do a simple simulation with MATLAB? I mean , Can we simulate a scenario in EMT without using Epanet-MSX ? @Atosa, EPANET-MSX just use for multi-species analysis quality in network and you can apply EPANET for hydraulic and simple quality analysis. I mean, if you want to consider only one concentration such as computing chlorine residual at nodes, you can use EPANET. In the other words, MSX use for advanced quality analysis at water distribution network. EMT is a package which includes EPANET and EPANET-MSX functions. I just want to simulate the injection of Arsenic, but I don’t know exactly what command and function should l use. I wanted to generate 200 scenarios, first I tried to do this without using the MATLAB code and alone with EPANET. But it takes a long time! Each contamination scenario consists of a single EPANET mass injection event of rate 57000 and duration 6h. And the duration of entire simulation be 48h. But I didn’t see a function like “getComputedNodeQuality” and I’ve got error too! How to use these functions: G.setNodeSourceType, G.NodeSourceQuality? Also, you can check out the S-PLACE Toolkit v2.1 pre-released. Hi @Mariosmsk Great! you’re awesome. This is exactly what I was looking for. Really thanks. I don’t know how to thank you enough! Thanks so much! I wanted to make an injection at each node (For 6 h and at time 0), So I changed the code, but Why are the results (by MATLAB and EPANET) not the same? But the results are not the same in MATLAB and EPANET! But the node2 will not be affected at any time by injection into node 1. Do I make a mistake?What’s wrong? Results in the Q cell array are based on the indexes? 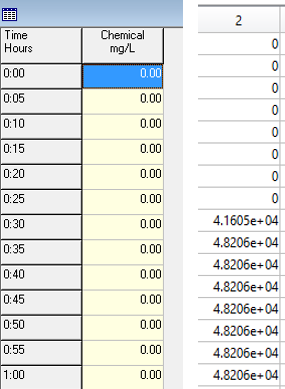 @Atosa, Yes, The columns in the Q matrix refer to nodes index and the rows refer to time. Pay attestation, each row is for a time step report (5 minutes in your program). Hi @alireza2032 and @Mariosmsk , Thanks. So I confused the ID and Index.